Summer in California means strawberry season! 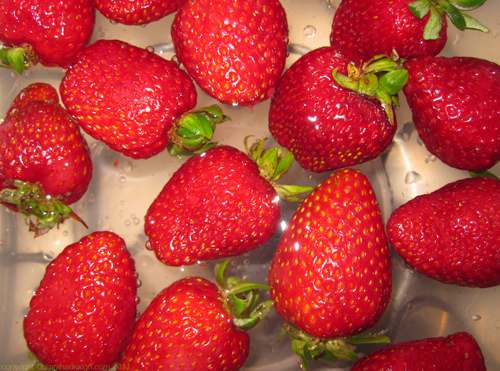 While the produce you can find here is pretty good year round, the strawberries during summer are the best. This lot which I picked up at the farmer's market was amazing, super sweet and juicy. The stall was clever - they had samples to taste. 3 pints for me please! We at most of them plain because they were so good but I made an Eton Mess dessert with fresh raspberry sauce, meringue and a not-too-sweet cream. I thoroughly enjoyed the farmer's market, there was so much good, fresh produce that it was hard to decide what to buy. The scent of fresh herbs (basil, mint, parsley, tarragon, rosemary) is one of my favorite things, I have yet to set up a herb garden on balcony though. In the end I staggered to my car under the weight of a lot of veg and fruit simply because it looked so enticing and made menu planning easy. And because it's all fresh and often organic, it lasts well in the fridge at home. Next time I need to a) take my camera and b) get a little trolley to put everything into!